Here’s a framework to help you understand why logic says equity in the Indian context should deliver a certain return. It’s easy to discount logical thinking when one sees the emotionally charged commentary on stock markets. The people, however, who value logical choices over emotionally charged decision making invest in equity for some pretty good reasons. Not only do they have good reasons but they also know what to expect in terms of returns, risk, and have a reasonable understanding of the underlying logic behind why equity markets should deliver results they are seeking. In the case of equity markets, having an understanding is not only important but helps us maintain our sanity (and our wealth) when we are confused by the see-saw motion of the markets. Here’s a framework to help you understand why logic says equity in the Indian context should deliver a certain return. It’s important that you understand this framework and try to relate to it. Historical evidence suggests that the Sensex has delivered close to 13-14% per annum return over the past several years. If you had bought into the Sensex, in any 5 year period in the past, you would have been better off than the post-tax fixed deposit rate of returns. One can ask, so what? Just because it has grown in the past does not mean it should grow in the future. Will the Sensex still return close to 13-14% per annum? The Sensex is essentially a collection of companies and it reflects the performance of a collection of companies. 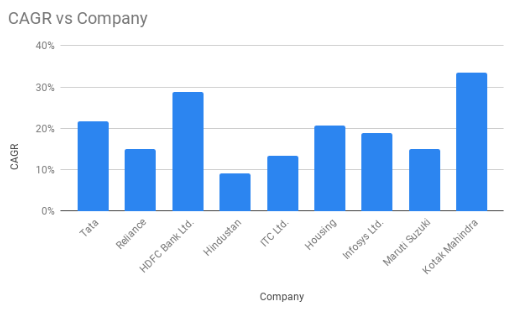 Some of the large companies in the Sensex today include companies like Reliance, TCS, HDFC Bank, HDFC, ITC, L&T, Infosys, Maruti, Kotak, etc. Essentially, the Sensex has delivered about a 13% per annum return because the underlying companies in the Sensex have grown at about 13% per annum or higher over the past several years. The beauty of the Index is that, the best companies automatically get captured in the Index. Next comes a logical as well as important question. This is where even investment professionals start to have doubts. These companies have already grown large and are unlikely to grow as fast. Aren’t equity returns likely to be much less in the future? Most large company’s growth is linked to the growth of the economy. The Indian economy, in real terms has been growing at 7.4% per annum, whereas its growth in nominal terms* has been close to 14% per annum. Looking at the growth of companies, you’d have to acknowledge that if the economy is growing at close to 12-14% per annum, then the successful companies operating in the economy should grow at about the same levels. The question now is, will India grow well in the future as well? Has India reached its full potential, or is the story just getting started? One of the factors used to measure the stage of development of an economy is the average GDP per person. 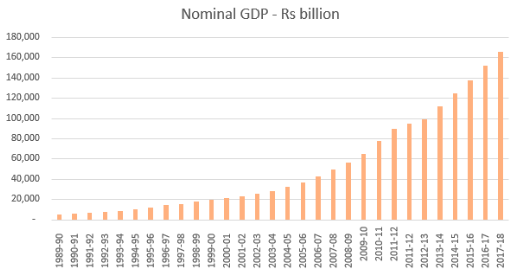 On this count, India has been growing at a reasonable pace. In 1968, about 50 years back, India’s per person GDP was $ 100. It has grown nearly 20 times over the past 50 years. It is likely to continue this growth, given the favourable demographic profile. The world economy has also been growing at a reasonable pace. More importantly, India is trailing the world at large and the growth path is quite clear. There is a lot of room for improvement for India on this front and if there are a few good years in the future the rate of our growth should improve substantially on this front. If you buy into the Indian growth story, and that of both its economy as well as its companies, then logically equity is going to deliver better than any fixed income alternative. If you don’t agree with this train of thought, then you are probably investing in equity for the wrong reasons. *Nominal GDP includes the volume growth in GDP along with price increases.